This is an exciting day for us at ‘The Gathering.” One of our greatest desires is to encourage and connect with women of like mind. It is wonderful to see the hearts and lives of women transformed, through their interactive relationship with Jesus Christ. When we choose to dive into God’s word daily, it leads to the renewing of our minds, and an overall change in our lives. Over the past 18 months or so, God has been slowing leading me into another “season of life.” Along with His written word, God has linked me up with an incredible woman, whom He has blessed with the gift of writing. My friend is one of the most “for real” ladies, I have met in a long time. She does not make false claims about life, nor does she “tickle” your ears with the world’s view of marriage. She does however, stand firmly on the written word of God, instructing, guiding, and spurring us on as women, wives, and mothers. 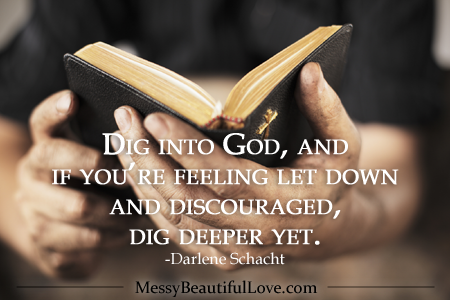 My dear friend, Darlene Schacht, is the founder of ‘’The Time Warp Wife.’’ She uses the infallible word of God, as well as life’s blessing and trials to minister to women of all ages. 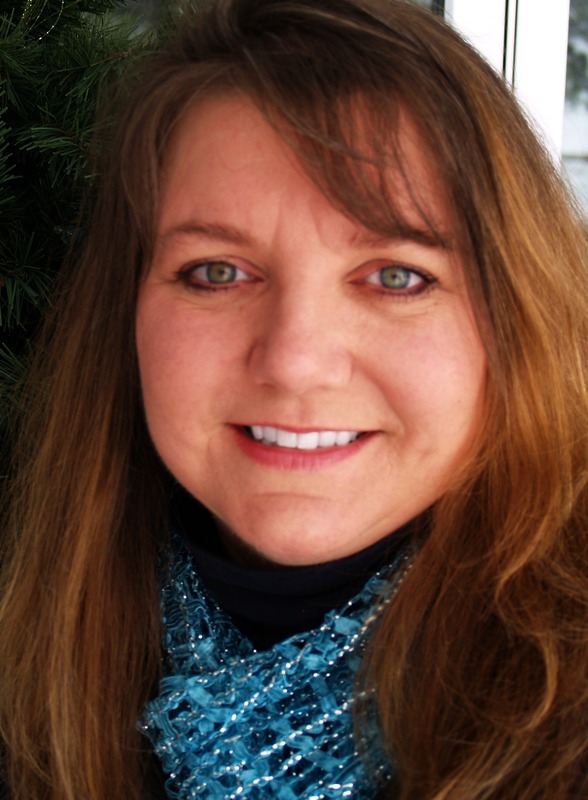 Darlene, an Evangelical Christian, is the wife of Michael and mother of four. She, along with her family and pets, enjoy their quiet Canadian life filled with faith, family, friends, music, and books. Now for my SPECIAL announcement!! With great excitement (squeal) I write this blog…. 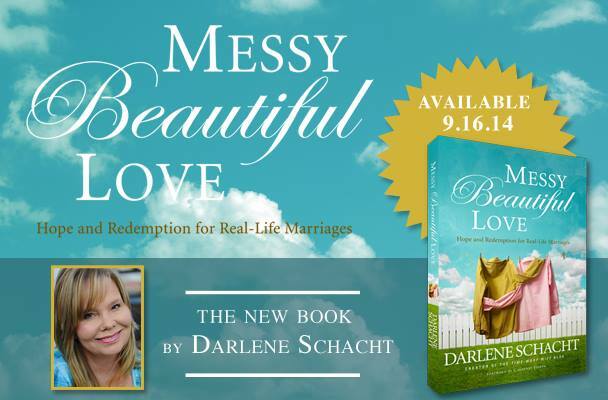 The Gathering has been chosen to partner with Thomas Nelson Publishing and Darlene Schacht in promoting Darlene’s newest book. We all know that marriage is BEAUTIFUL, when we choose to “love-on” our husbands, as Christ loves the church. 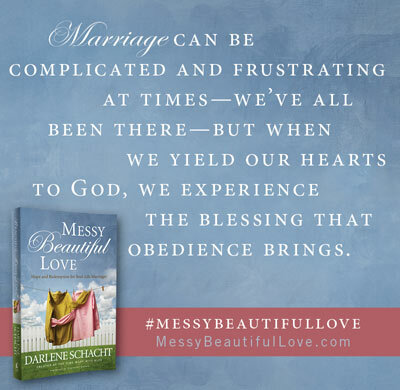 But marriage can get a bit messy, especially when, our eyes start to focus of the temporal things of this world…. when all that’s in front of us is out of focus. When we replace “love” for selfishness, pride and anger. 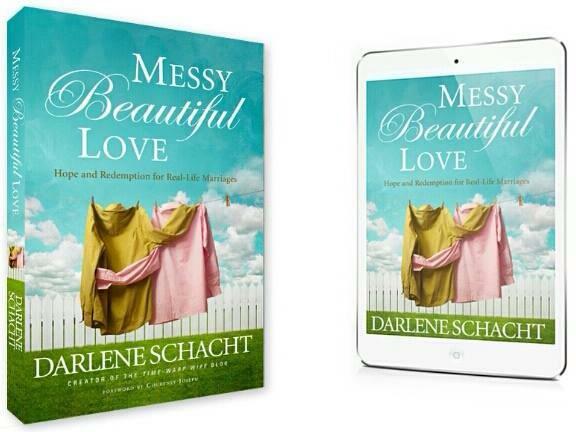 Darlene equips us as wives, to rid ourselves and our marriages of our own ideals…our own ways of doing things. She guides and encourage us to “put on” the virtues of a godly wife, to walk in obedience to God’s will…..and God’s way of doing life with our husbands. I have already started reading my advanced copy. I will be writing a book review at Amazon and Barnes & Noble very soon. Please watch for it. Grab yourself a cup of coffee or a glass of tea and get ready!! Start investing in yourself, by pre-ordering a copy of this fabulous book!! When you do so, there are some special gifts for you!! 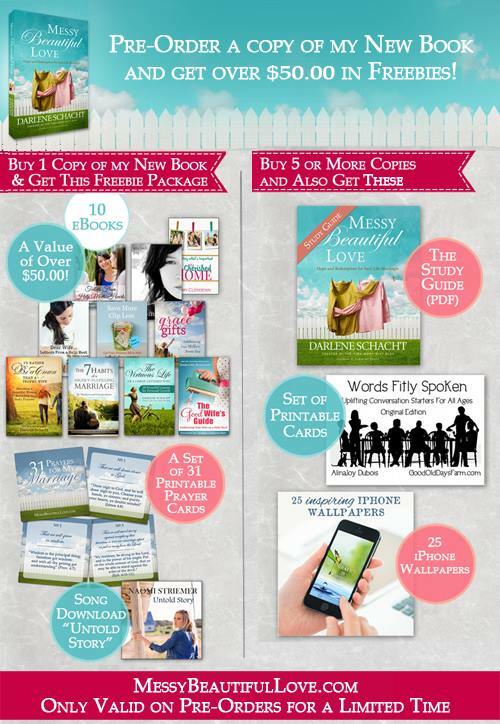 With each pre-order of: Messy Beautiful Love: Hope and Redemption for Real-Life….there are many FREEBIES!! I am loving the study guide and all of Freebies!! Can’t wait to dig in!! How to claim these wonderful FREEBIES!! 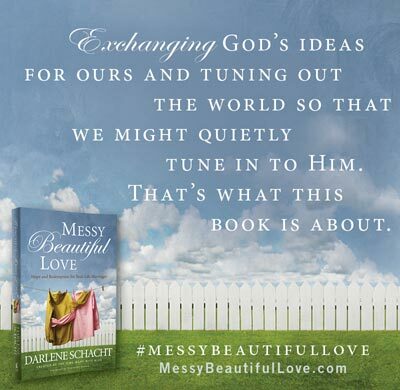 Darlene writes, Once you have purchased one book or five, simply email us at: MessyBeautifulLove@gmail.com. Provide us with your receipt/order confirmation number & the number of books you purchased, and claim your freebie package! Please be patient as it may take a day or two for the freebies to arrive. I encourage you to set aside some time and invest in your marriage… by investing in yourself. Grab hold of God’s word and this book. God has used Darlene’s gift of writing to encourage me so many times. Her last book, which is included as a FREEBIE, took me to another level of spiritual growth. It transformed me into someone I needed to be. It prepared me to walk down a very, very difficult path, these last five months. I know what it is like, to battle with bad attitudes, false expectation of yourself and your spouse. I know what it is like, to see your spouse walk through the valley of death, as his best friend died in front of him. Our declaration, “to live for Christ and walk in His ways at all times,” becomes reality when trouble and trials come our way. Our God is a loving and merciful God. He will equip you, as the wife of your husband, for the challenging days ahead. Now is the time to prepare for your future. God’s word and Darlene’s book will change your life….. if you let them.